With some trepidation, I caught the Broadway revival of Jesus Christ Superstar the day before it opened at the Neil Simon Theater on March 22. I’m happy to report that this incarnation of the pop rock opera, with lyrics by Tim Rice and music by Andrew Lloyd Webber intact, is a thrilling revelation. The production originated at the Stratford Shakespeare Festival where it was helmed by artistic director Des McAnuff. I remember being underwhelmed by the concept and film back in the ’70s (the rock opera originated as a hit “concept album” and then broke records on Broadway, opening in 1971). The 1973 film starred Ted Neeley as Jesus Christ and singer Yvonne Elliman as Mary Magdalene. Despite the passing of four decades and never having seen the original Broadway production, I was surprised to find myself remembering the lyrics and singing along under my breath during this revival. The show moves like wildfire, which is a major plus for “hyper-moderns” who are used to speeding through life via the Web and for over-booked Boomers. It’s loud but not too loud, just loud enough to get you to feel “the passion,” in every sense of the term. The scenic design is simple yet imposing. Designer Robert Brill wraps the stage in silver metallic scaffolding that the mostly modern-dressed cast acrobatically climbs and moves about with abandon. Jesus’s final six days are clearly tagged on a “daily” ticker feed that spreads across the scaffolding. The vocal talents of this cast are extraordinary and that’s an understatement. 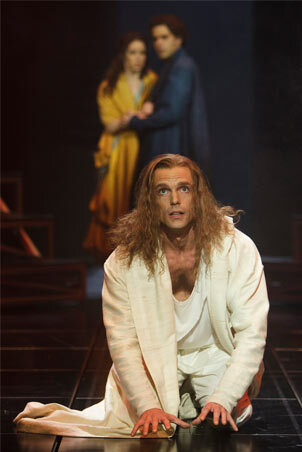 Kudos most especially to Paul Nolan as Jesus and to Jeremy Kushnier, who played Judas Iscariot during the performance I attended. Kushnier pulled out all the stops in a star-making performance (he normally plays James the Lesser/Priest and understudies Josh Young as Judas). Both Nolan and Kushnier have vocal ranges that defy description, and Nolan will no doubt attract a huge female following during this run as beneficent, beauteous Jesus. Other stand-outs include the understated but unnerving performance by Tom Hewitt as Pontius Pilate and the bawdy turn by Bruce Dow as King Herod, who conjures up fond memories of a twisty Nathan Lane. This entry was posted in Theatre and tagged Andrew Lloyd Webber, Broadway Musicals, Des McAnuff, Musical Theatre, Religion, Rock Opera, Tim Rice. Bookmark the permalink.